Called to Succeed, Inc. (CTS), a company selling travel memberships, wanted to provide an exciting incentive promotion for its members to sell more of its travel membership services to their friends and family. In addition, CTS also wanted a way to have its new members share in the fun of the promotion as well. The plan was to run a month-long Sweepstakes called ‘Rocket Fuel Promotion’ where members of the travel club would earn Sweepstakes entries by having new members sign up with them, and for the new members who signed up to also be entered into the Sweepstakes as well. 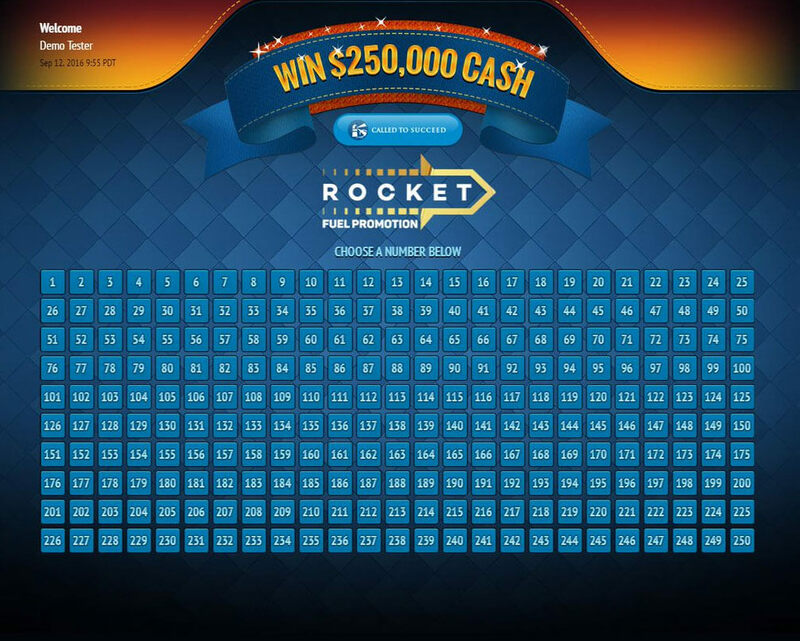 At the end of the Sweepstakes period, two randomly selected winners, one existing member and one new member, would get the chance to play and potentially win the grand prize of $250,000 each or a consolation prize package worth $7,500 each. Contest Factory designed and implemented for CTS an exciting interactive game for the two Sweepstakes winners to play for a chance to win the grand prize. Once the two Sweepstakes winners were selected, they were directed to visit Contest Factory’s game site. As part of the legal requirements, CTS and Contest Factory’s legal teams witnessed via video conferencing as the 2 players (one at a time) registered to the game site and randomly selected an integer between 1 and 250. If the number the player selected matched the number the system generated the player would win the $250,000 grand prize, while an incorrect selection awarded the player a consolation prize of a Dream Trip package worth $7,500 to any one of the vacation destinations offered by CTS. The Rocket Fuel promotion was a success for Called to Succeed. CTS added new members to its travel club and increased the loyalty of its existing members by awarding great prizes to the winners.